for wave riding. 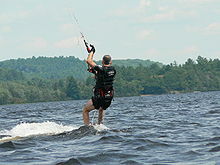 A kitesurfer or kiteboarder uses a board with or without foot-straps or bindings, combined with the power of a large controllable kite to propel the rider and the board across the water. In 2006, the number of kitesurfers has been estimated at around 150,000 to 210,000, with 114,465 inflatable kites sold that same year. Riding styles have evolved to suit riders and conditions, such as wakestyle, waveriding, freestyle, freeride, jumping, and cruising. Although kitesurfing is an extreme sport, its safety record is improving due to advances in hybrid and bow kite designs and the ability to control the power that they provide, effective safety release systems, and wider availability of kiteboarding schools such as the IKO and BKSA and the resulting improving teaching standards as the sport matures. There are still a number of deaths every year and a much larger number of serious injuries and accidents. In the late 1970s the development of Kevlar then Spectra flying lines and more controllable kites with improved efficiency contributed to practical kite traction. In 1978, Ian Day's "FlexiFoil" kite-powered Tornado catamaran exceeded 40 km/h. and his friend Andrea Kuhn/Switzerland used this invention also in combination with surfboards and Skurfs, grasskies and selfmade buggies. One of his patents describes in 1979 the first use of an inflatable kite design for kitesurfing. commercially available in 1994. The kite had a rudimentary water launch capability and could go upwind. In 1995, Cory Roeseler visited Peter Lynn at New Zealand's Lake Clearwater in the Ashburton Alpine Lakes area, demonstrating speed, balance and upwind angle on his 'ski'. In the late 1990s, Cory's ski evolved to a single board similar to a surfboard. In 1996 Laird Hamilton and Manu Bertin were instrumental in demonstrating and popularising kitesurfing off the Hawaiian coast of Maui. In 1997, specialist kiteboards were developed by Raphaël Salles and Laurent Ness. By 1998 kitesurfing had become a mainstream sport, and several schools were teaching kitesurfing. The first competition was held on Maui in September 1998 and won by Flash Austin. By 1999 single direction boards derived from windsurfing and surfing designs became the dominant form of kiteboard. From 2001 onwards, twin-tip bi-directional boards became more popular for most flat water riders, with directional boards still in use for surf conditions. Speed records French kitesurfer Sebastien Cattelan became the first sailor to break the 50 knots barrier by reaching 50.26 knots on 3 October 2008 at the Lüderitz Speed Challenge in Namibia. On 4 October, Alex Caizergues (also of France) broke this record with a 50.57 knots run. These speeds are verified, but are still subject to ratification by the World Sailing Speed Record Council. Earlier in the event, on 19 September, AmericanRobert Douglas reached 49.84 knots (92.30 km/h), becoming the first kitesurfer to establish an outright world record in speed sailing. Previously the record was held only by sailboats or windsurfers.Douglas also became the world's third over-50 knots sailor, when on 8 September he made a 50.54 knots (93.60 km/h) run. October 2010, Rob Douglas became the outright record holder for the short distance 500 meters with 55.65 knots. 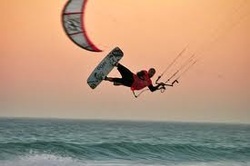 Sebastien Cattelan became the record holder of France and Europe with 55.49 and was the first rider to reach 55 knots. Distance records and notable journeys It is possible to travel great distances on a kiteboard on a journey referred to a "downwinder".Kirsty Jones set a distance record for a kiteboard when she travelled 225 km (140 miles), crossing solo from Lanzarote in the Canary Islands to Tarfaya, Morocco, in about nine hours on 13 May 2006. A record combination of distance and speed of 207 km in 5h 30m was set by Raphaël Salles, Marc Blanc and Sylvain Maurain on July 24, 2007 between Saint Tropez and Calvi, beating Manu Bertin's previous record of 6h 30m for the same journey. Their average speed was almost 38 km/h. Eric Gramond set the distance record when he went 419.9 km (226 Nm), crossing from Fortaleza to Parnaiba in Brazil during 24 hours on October 12, 2008. Natalie Clarke crossed Bass Strait from Stanley, Tasmania to Venus Bay, Victoria in Australia, a distance of 240 km, in 9 hours 30 minutes on March 22, 2010. Texas, USA, from 10 to 11 May 2010.
devices.Turning A beginner can turn by stopping or sinking backwards into the water,and then turning the kite in the opposite direction and starting again. A 'heel turn jibe' is a quicker,and more skillful turn that is executed by slowing down,flattening the board, then reversing the board flat on the water by bringing the rear foot around downwind to eventually become the new leading foot. The direction of the kite is then reversed, which swings the surfer's path in a semi circle, centered on the kite. As the turn ends, the kite is flown over to be in front of the surfer again. A poorly executed turn will "fly" the surfer, and is often followed by a tumble if the surfer can't put the board down at the right angle. Wind strength and kite sizes: Kitesurfers change kite size and/or line length depending on wind strength—stronger winds call for a smaller kite to prevent overpower situations. Kitesurfers will determine the wind strength using either an Anenometer or, more typically, visual clues as shown in the Beaufort scale. style are all interdependent and affect the choice of kite.An experienced rider generally carries a 'quiver' of different sized kites appropriate for the wind speed range. A typical kite quiver might include 9 m²,13 m² and 18 m² traditional "C-kites". Exact kite sizes will vary depending on rider weight and desired wind ranges. Bow kites have a wider wind range than C-kites, so two kite sizes (such as 7 m² and 12 m²) could form an effective quiver for winds ranging from 10 to 30+ knots for a 75 kg (165 lbs) rider.